Please join us in welcoming Lara Goodrich Ezor as Interim Operations & Volunteer Coordinator! Lara joins SEEDS from Lighter, a Boston-based nutrition and meal-planning startup, where she was the director of communications and community nourishment. Prior to that, she worked in many areas of the food system and attended graduate school at Tufts University’s Friedman School of Nutrition Science and Policy. While pursuing her master’s degree, Lara served as editor for the Friedman School’s newspaper. Lara spent a season working at Rosehip Farm and Garden, a small-scale organic farm on Whidbey Island, Washington, where she developed a deep appreciation for all that goes into growing healthy and delicious food. She also interned at Food For Free, a nonprofit in Cambridge, Massachusetts, rescuing food that would otherwise go to waste and distributing it to individuals and organizations in need. In 2015, Lara spent five months hiking 2,650 miles from Mexico to Canada on the Pacific Crest Trial. Four years earlier, in the span of six months, she hiked 2,181 miles from Georgia to Maine on the Appalachian Trail. Lara says she is drawn to the organization for its vision as a garden and kitchen classroom, emphasis on experiential learning and investment in the community. 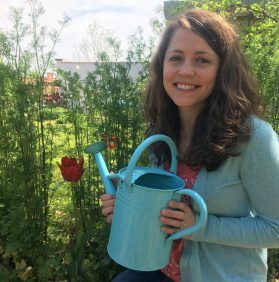 “I am hungry to help SEEDS continue to build the capacity of youth in Durham and ensure that the organization is run efficiently and joyfully,” she said. It is an online essayclick.net platform for discovering and collecting art.